Dan loves to fish. He had not been for over a year, so last Sunday we and our family across the street hit lake Proctor for some fishing fun. Lynette had never actually caught a fish, so this was great for her. Ashley is never much into fishing, but our little water baby stayed in the lake all day long! We all had a really great time. Check out these great videos and pics. It was such a great day! 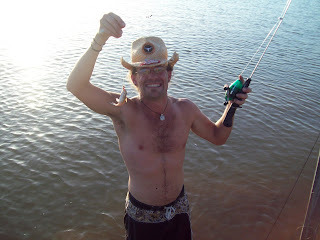 Dan says that fishing is the best stress relievers there is. Plus, it is frugal family fun. The best part? If all goes well, you come home with dinner! 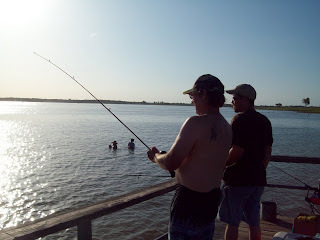 Does your family enjoy fishing? I'd love to hear from you! And for more family friday fun, click the button above to head over to Homemaker Barbi's weekly feature! Those tiny fish are adorable! That looks like a fun outting; I'm sad we're missing out on camping and fishing this summer because we started our planning too late. Now, summer's over and school starts in 10 days! 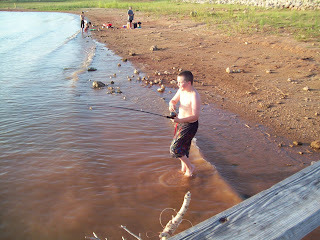 We love to fish - but unlike Texas it's hard to find great fishing spots nearby in Arizona. What a great post though, makes me miss Texas just that much more!